Today I am excited to introduce you to a brand new shop called FabricCadabra. One thing that is really great about this shop is that the owners, who also happen to be sisters, really love fabric and that love shows in their fabric choices. Right now they have a gorgeous selection of mostly Art Gallery prints (including Arizona!). Since their shop is so new I thought it would be great to have them introduce themselves so you can find out a little more about them. We are two sisters who love fabric and love to sew and make things. Lastenia is the oldest and wisest of our family of 7 children, and I (Makyka), am the 5th and between the two of us we have 13 kids. Lastenia started sewing in 4H as a young girl, and made clothes for all our Cabbage Patch dolls. While she was honing her mad dress making skills (eventually making all of our wedding dresses), I was running around in wheat fields pretending to be an Indian princess. Eventually I learned how to sew enough to where I could decorate my room. Since then we’ve become level 15 sewing ninjas, turning out everything from doll clothes, dresses, and bow ties to pillows and curtains. When we’re not running around to 5 different soccer teams and 12 music lessons between our two families, we create things with our handy-dandy sewing machines so it seemed only natural to open a fabric shop. Fabric makes us happy and our goal is to make something out of every fabric we sell in our shop, which won’t be hard since we create with each other. We love doing this together and hope you’ll join us on our FabricCadabra adventure. FabricCadabra has been nice enough to offer a giveaway for us today. One lucky winner will receive a fat quarter bundle of Leah Duncan's Meadow. I love, love, LOVE this collection. 1. Just leave me a comment on the post. 2. For a second entry, follow FabricCadabra on Facebook or Instagram. The giveaway will be open until 5pm PST on Friday October 10th. I love those fabrics too and it would be so much fun to run a fabric store with my sister! What a great fabric store name! Love it! I look forward to doing some shopping. Love love this line and pretty much all AGF. Lol. Thanks for the chance to win. I'm going browse their shop now to see what they have. What pretty names! I've never heard them before :-) And wow 13 kids between you two! Fantastic fabric choices in your new shop. Congratulations on setting up! How do they have time to run a business with all those children between them? Love the fabrics. What a sweet story! Thanks for the chance to win! I had fun sewing with my sister today too! Wish she lived close by so we could do it more often. What a great name for the shop. Can't wait to explore. I think this is a terrific collection. Thanks for the chance to win it. Good for them...living the dream! Can't wait to check out their shop. I love that fabric! So pretty! I love the fabric but the name is perfect! Says it all. I just added you to my FB following. Great fabric! Thanks for the opportunity! What a cute background story!! Congrats on the new shop girls, hope you do well! Thanks. I loved reading about FabricCadabra sisters! Fabric makes me happy too! Owing this fat quarter bundle would make me ecstatic! Hi! It's exciting to see a new fabric store, especially one operated by enthusiastic sewists! Thank you for sponsoring this giveaway! love this line too! Thanks for the giveaway! I love this fabric! What lucky sisters to be able to work and play together! I've just checked them out on IG and started following them. Thanks for the chance to win. I love these fabrics. Thanks! Nice fabruc choice. Thanks for hosting. Gorgeous fabrics - thank you! I'm following FC on facebook! Good luck on your new store. I am following you on FB. Thanks for the chance to win this gorgeous bundle! I liked FabricCadabra on FB. Wishing the ladies all the best in their new adventure!!! I am following Fabricadabra (love that name!!) On FB and IG!! Thanks for the chance to win this yummy bundle of fabric!! I am following you via Bloglovin'!! Thanks for another chance!! I am following Fabricadabra on facebook. Love Leah Duncan's Meadow fabric. Thanks for a chance to win. I agree. These are beautiful fabrics! Thank you for the giveaway! Such a pretty fabric line! Great shop name and prize! Miss my sis...love those colors! I am a new instagram follower. Do they make quilts? Thanks for the giveaway. Fun fabrics. love the color combo. That collection is so pretty!! I love the fabrics in that collection! I love being introduced to new fabric stores -- and love when families work together on new enterprises focused on their passions. Best wishes to the sisters on their new adventure! And this fabric is gorgeous! Would love to win it. Liked their FB page and added them to my FB fabric feed. Thanks for the giveaway! Love the fabrics and love to hear about new fabric stores. Such fun fabrics! Thanks for a chance to win! What a couple of cutie sisters! Looks like they are having a ball! Congratulations to FabricCadabra on the new shop. Beautiful fabric collection. Pick me! I swoon at that collection! I browsed their shop and they have some lovely fabric. Thank you for this opportunity to win. Co gratulations on the new fabric shop! They have gorgeous fabric. Fingers crossed. I could it. Thanks! Great blog and contest! 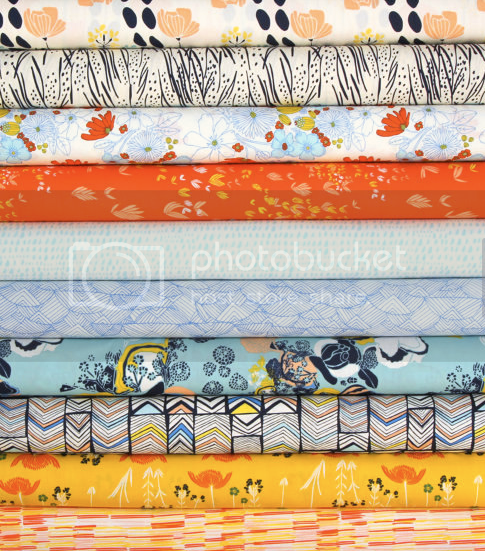 What a fun fabric bundle. I would love to run a fabric store with my two sisters. 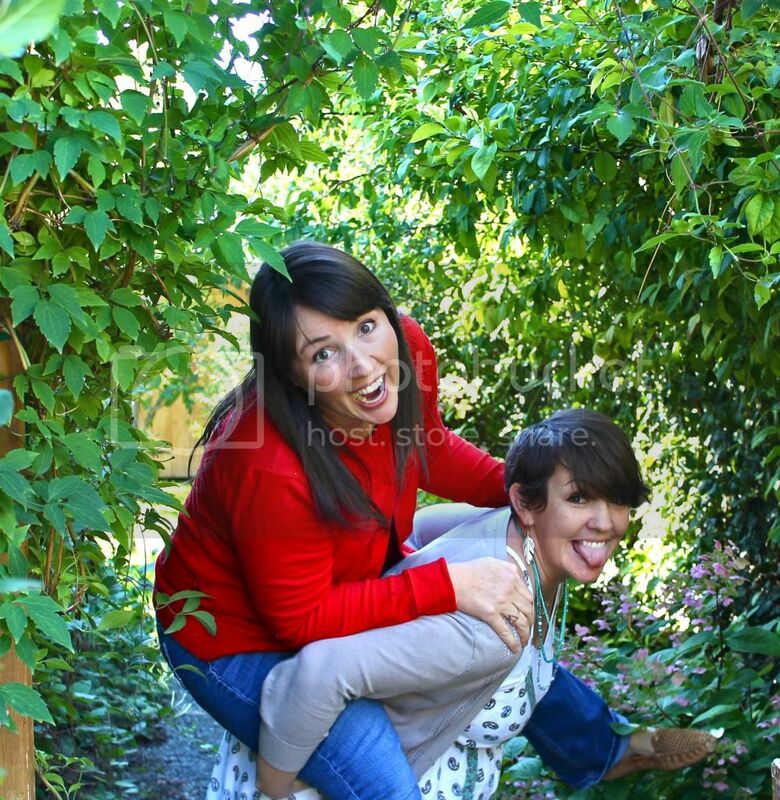 Would find so much creative time with my sister so fun too. Have been coveting this fabric line too! What a great name for a quilt shop! Lovely fabrics, too. Thanks for the chance to win! Good luck to them both! What FABULOUS fabrics! I would love to play with those fabrics. Thanks for the giveaway. I love that fat quarter bundle! I wish Fabricadabra all the best with their new business. Wish I had a sister to run a fabric shop with me! I follow Fabric Cadabra on FB! What a lovely fabric line! I haven't used fabric by Leah Duncan yet. I would love to though! I am following FabricCadabra on FB. I love, love that collection. Would look great in pillows for my Christmas gifts to my kids. Gorgeous... off to poke around the shop! Art Gallery Fabric has such a nice hand. I've liked their FB page. Thank you for sharing this shop. Oh I love that fabric so much! Would love to win! Love hearing about new fabric shops!! Love the fabric choices for the giveaway. Ideas are just waiting for it!! Will definitely follow on FB. A great collection choice for a giveaway! Thanks!! I've wanted this so badly! Please pick me! What a fun name for a fabric shop! FabricCadabra, is a new to me shop. Thanks for the introduction. I am now following FabricCadabra, on FB. I don't know how they have the time to do so much with such large families. Congratulations on your new shop! I wish you much success. You're starting out great by giving something to others! I am now following FabricCadabra on Facebook! Wonderful combination of colors and patterns. Would make a great table runner or place mats. Love the shop name - how clever! And that fabric bundle would be fun to play with. Love these fabrics! Thanks for the chance! I love meadow! I need it! How fun to open up shop with your sister, thanks for sharing about their new store! Awesome! Great fabric and you guys are beyond cuteness! Beautiful fabric, and love the shop! What a neat shop. I will be visiting often, for sure! I love the name Fabricadabra! and I love that fabric line. What stunning fabrics! Thanks for the chance! Beautiful fabric. I love their fabric shop's name. So cleaver. Thanks for a chance to win. Holy smokes, sounds like you gals are very busy ladies! Love the collection of fabrics and congratulations on the new business..
Good luck on their new adventure! Love art gallery fabrics and the meadow line. I don't know if I just live in a closet, but I've never seen this collection! It's adorable! I'd love this bundle! I love the color combinabion in this Meadow bundle. Thanks for the chance to win. very lovely and generous bundle! thanks for the opportunity! Great bundle and respect for running a fabric shop with 12 kids on the side!! Wow. Great bundle! Pick me! Such a pretty collection! Thank you for the chance! I now follow fabricadabra on Facebook! Gorgeous fabrics. Love that fabric bundle, too. I need more orange. Love Meadows. Probably couldn't get any of my sisters to share my passion for all things fabric but my DIL, I think we're kindred spirits. So fun. Thanks. HI, what a neat fabric giveaway! I'd start a brand new quilt! Love the color combinations. Orange brightens everything! I love AGF and Leah Duncan is one of my favorite designers! I love the fabrics in their shop! Thanks so much for the giveaway! Love the fabrics! Really sweet! Great new sponsor! Love what they have in the shop! 13 kids?that`s fabulous and wishing you all the best in your shop. FabricCadabra, your name sounds fun.Thanks for the chance. Thanks for letting us know about this shop! What a great giveaway, and another Fabric place to enjoy!! What could be better than that :) Thanks! Thanks for an introduction to a fun shop! Love the fabric! This shop looks like a winner. I love the name, Fabric Cadabra! The fabric is pretty nice too. Would love to add it to my stash. Simply stunning fabric, I love the peach color that is thrown in. Thanks for the chance. Looove these fabrics! Colors are Beautiful!! Great to find a new shop, and they sure have good taste in fabric! Thanks for the chance! I'm off to follow them on Instagram! What a delightful shop! Thanks for introducing Fabracadabra! I'm now following them on Facebook. Thanks for the fun!